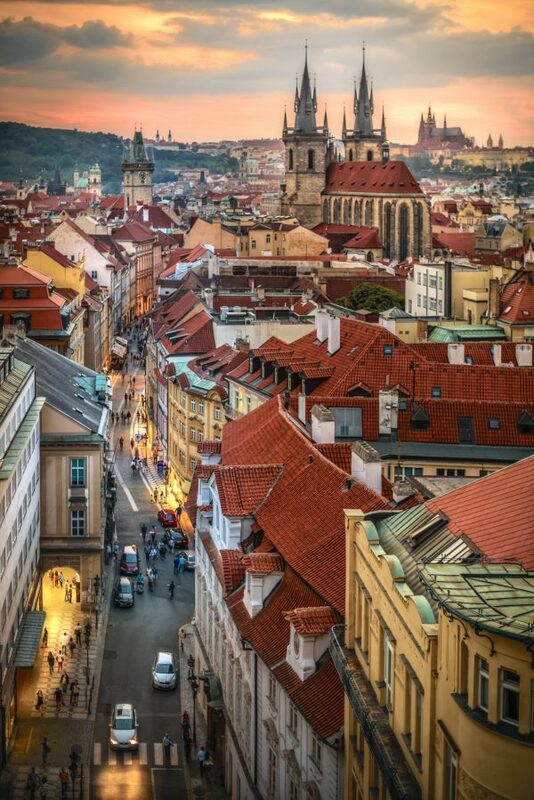 It was with some misgivings that I prepared for my visit to Prague, Czech Republic’s capital nicknamed City of a Hundred Spires after its numerous spire-topped buildings, castles, and cathedrals. I had been there once before, but that was 43 years ago, so it would be a re-immersion into a place I barely remembered. I looked at maps of the city, trying to remember street names and squares, and recalled being hit by a streetcar—or rather, I hit a streetcar with my huge backpack. On the advice of a Canadian friend who lived 10 years in the Czech Republic and visited Prague countless times, I decided to start my exploration at two points central to the origin of Prague’s existence: Vysehrad on the east bank of the Vltava River and Prague Castle on the west bank. My first stop was Vysehrad, a 10th-century historic fort, which was later planted with vineyards, gardens, and fields. 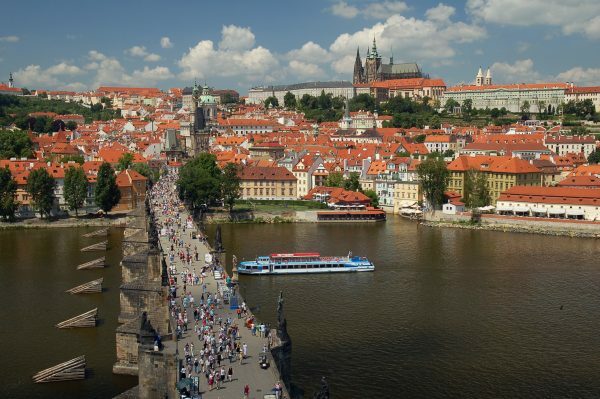 Here you can visit the remains of Prague, circa 900 to 1100. As I passed through the Leopold Gate and visited the ancient rotunda church and the Basilica of St. Peter and St. Paul, I felt truly rooted in Prague’s early years. Needless to say, a city of Prague’s age has many important cemeteries. At Vysehrad, you can visit the graves of well-known figures of the country’s history and culture—composers Dvorak and Smetana to name just two. Extraordinary views of Prague Castle, my second starting point, can be found here as well. 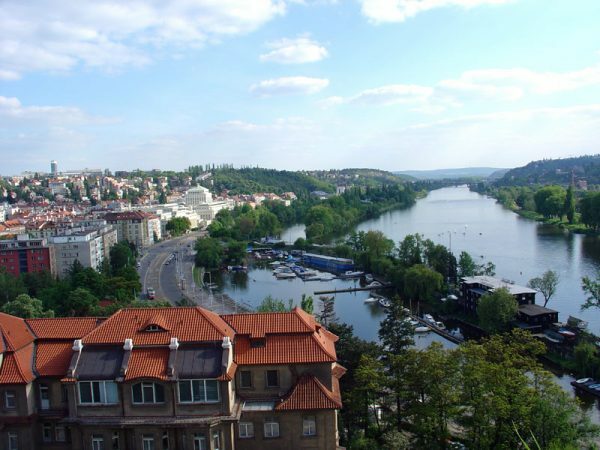 And stunning views of Prague’s lovely river, the Vltava, can be had from both Vysehard and Prague Castle. 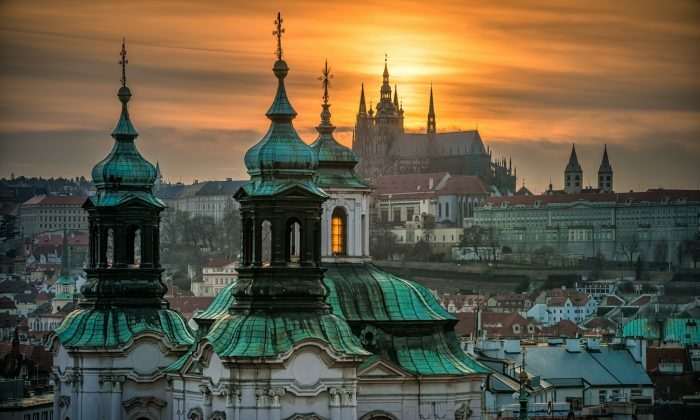 The stunning Prague Castle complex consists of St. Vitus Cathedral, the Basilica of St. George, a monastery, and several palaces, gardens, and defense towers. St. Vitus Cathedral, the largest religious building in Prague, is well worth a visit, although it is likely to be swarming with tourists. Another gem within walking distance is the more discreet Lobkowicz Palace, which houses precious books and original manuscripts by composers such as Beethoven and Mozart. From Lobkowicz to the Little Quarter it is literally all downhill as you pass through a second area of the St. Wenceslas’ vineyards, considered to be the oldest in the Czech lands. When you reach the Little Quarter, Mala Strana, you may choose to linger, but you will inevitably make your way over the Charles Bridge along with thousands of other pedestrians. What a contrast! During my 1975 visit, there were much fewer people and it seemed as though I was the only tourist. At the other end of the bridge, you will enter the beautiful maze of the Old Town. Using the Old Square, Staromestske Namesti, as a starting point, let your imagination guide you. This is a lovely area to walk in, and you will come across great shops, restaurants, and a number of interesting galleries and museums. I learned a great deal about the ancient Czech and Bohemian art of glassmaking at the Glassimo Gallery and the flagship store for Preciosa, which was formed in 1948 with the amalgamation if 25 small and large glassmaking companies and factories in the region, continuing an almost 500-year-old tradition. Both the gallery and store are located in Josefov, or Jewish Quarter. The Old Town can also be swarming with crowds. If you want a break, I recommend visiting the Convent of St. Agnes of Bohemia, another site that since the 13th century has been a respite from daily life. This is the home of the National Gallery’s Medieval and early Renaissance art collection. 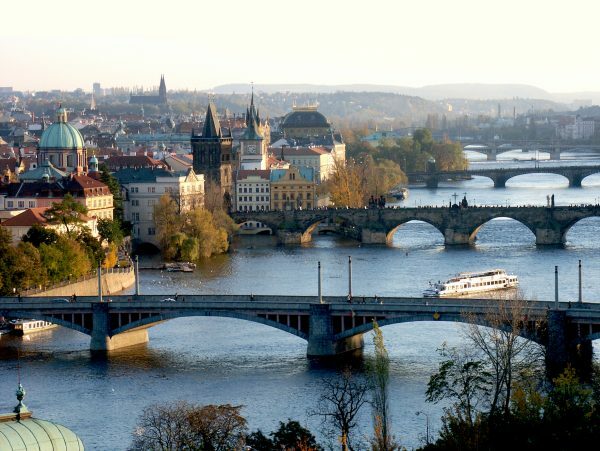 The beautiful gardens here are a link to Prague’s quieter past and flank the Vlatava river. Not too far away in the Old Town Square is the City of Prague Museum: House at the Golden Ring, where a 3-D model shows Prague’s development from its earliest beginnings. I would highly recommend this if you’re interested in understanding the city. I loved both of my hotels in the New City—in Prague, this means it’s still centuries old—for very different reasons. The Radisson Blu Alcron is located close to Wenceslas Square, a place where, historically, Czechs would come to protest and where the famed writer Franz Kafka once worked. Across the street from the hotel is the entrance to the Lucerna Passage, an arcade that serves as an important entertainment spot for locals. Inside is a 100-year-old cinema once owned by Vaclav Havel’s grandfather, as well as an intimate music club that hosts world-beat artists. (Vaclav Havel was the Czech Republic’s first post-communist regime president.) And at the opposite end of the Lucerna Passage is Mysak, a cafe that originally opened in 1911. The K+K Hotel Central is housed in a truly lovely Art Deco building that remained closed during the communist years. It is a real hidden gem. The Art Deco elevator is even protected by UNESCO! Tourists come in to admire but are shooed away by hotel employees. Bruce Sach is a veteran travel writer based in Ottawa, Canada.